Don’t you just love the look and feel of old houses? They have this uniqueness and history to them that makes you wonder: who lived here first? Who picked out this retro wallpaper, who slumped on the couch after a long day and who threw on an apron and got down in the kitchen? Or are you more of a new house gal? Modern design and decor light you up like that dazzling chandelier in the foyer. You swear you would never let it collect dust. Not to rain on the parade– but whichever house type you are there are problems to consider with both. Your darling old home and your beloved new home are both going to be flooded with pollutants and poor air quality. Poor air quality is nothing new. It comes from the infrastructure of your house, the grounds it was built on, old furniture, new furniture, and everyday household items. Thankfully, your home can still be your favorite spot and safe haven by taking steps to purify your air with a top-notch air purifier. 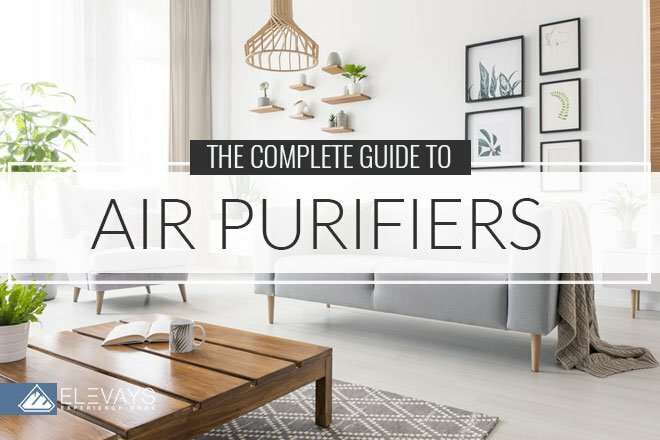 In this complete guide to air purifiers, we are going to dive deep into the harmful toxins that prowl indoors and then set you up with the best options for complete annihilation. Think of an air purifier as the employee that gets employee of the month, every month. They are the very best and most consistent when it comes to getting the job done. And for air purifiers that means getting all that funky gunk out of your indoor air. They filter out dust, allergens, and pollutants so that your air is ready for a deep inhale. They do a bang-up job for places you spend most of your time like your home and office—and they are a must for a non-toxic lifestyle. The best air purifiers (the ones I’m going to be talking about) use natural and effective filtration systems that work at the molecular level to trap and eliminate even the smallest particles. Since more than half of the body’s intake during life is air inhaled in the home…this is a pretty big topic for us. Do you hang around in your humble abode often? Do you sleep there? Do your children? Do you have a cat? A dog? Breathe? Air purifiers are perfect for any spot you frequent but are especially beneficial for people with allergies, pets, and who live in areas with poor air quality. A good air purifier will help you breathe cleaner and sleep better at night (and not just because you know you’re doing something good for your family). Everything that we breath goes into our bodies and affects us in some way. Think about this: if a lake has toxins in it then the fish in that lake become toxic. The same goes for our homes and buildings. Harmful toxins that lurk indoors become part of us and cause a host of problems. Many of the challenges that weigh on the 21st century lead to an increase in inflammatory disorders. Eye and nose irritation, respiratory problems, brain fog, fatigue, hormone disruption, and insomnia have never been more prominent and what we are discovering is that environmental toxins like pollution (outdoor and indoor) are a root cause behind inflammation. Known as PM or particle pollution, particulate matter is a mixture of airborne solid and/or liquid particles. The EPA is concerned with particles that are 10 micrometers or less in diameter because they are inhalable and once inhaled, PM can affect the lung and heart and in some more serious cases- other detrimental health effects (1). Your levels will depend on your filtration systems and hobbies. Indoor sources come from cooking, combustion (candles, fireplaces, unvented space heaters, smoking). You can reduce indoor PM exposure by avoiding the use of unvented stoves, fireplaces, space heaters and changing filters on central heating and cooling systems. When you think of VOCs, think of toxins that are emitted from common household items. These include cleaners, air fresheners, disinfectants, paint, furniture, pesticides, and new electronics. The chemicals that come off these items contaminate your air and can have carcinogenic effects with chronic exposure (2). The EPA’s Office of Research and Development’s “Total Exposure Assessment Methodology Study” discovered levels of a dozen common organic pollutants to be more than double inside homes than outside of homes. Researchers have identified over 133 VOCs and the average number emitted was 17 (most commonly limonene, pinene (pine scents), acetone, and ethanol). Each VOC containing product released 1-8 hazardous chemicals and 44% produced at least 1 out of 24 carcinogenic air pollutants—all of which the US Environmental Protection Agency says have no safe exposure level. As a consumer, it’s difficult to know whether the products we are using contain these contaminants because the Consumer Product Safety Commission does not require manufacturers to reveal ingredients on cleaning supplies, laundry products, air fresheners etc. The word fragrance means that a product contains a cocktail of hundreds of chemicals that react with ozone to form secondary pollutants and does not need to be disclosed (2). Understanding toxicity and adverse health effects are the first steps to making a healthy difference in your home. Were you ever one of those people that loved going down the candle aisle in any store and just sniffing every candle? Was Yankee Candle your favorite spot to gift shop? Popular candle companies use paraffin wax which burns benzene and toluene. The International Agency for Research on Cancer evaluated the carcinogenicity of benzene in humans in 1982 and found “…sufficient evidence that benzene is carcinogenic to man”. They established that human exposure to benzene can cause harmful damage to the hematopoietic system. Epidemiological studies found that benzene exposure increased the risk of acute myelogenous leukemia and chronic myeloid and chronic lymphocytic leukemia. Recent evidence of the carcinogenicity of high concentrations of toluene-exposed in animal experiments (3). In addition to those two troublemakers, scented candles are usually made with synthetic fragrances that disrupt hormones causing an increase in infertility and other health problems. The wick on the candle also contains lead—which is up next! Lead can be found in cosmetics, paint, dust, kitchen containers, art dyes, and glazes and maybe the most terrifying—our drinking water. Fortunately, air purifiers can eliminate most household lead besides the kind in our water (but don’t worry, there’s a water filter for that). Since lead is hard to flush out of the body, it bioaccumulates and leads to candida overgrowth, potential high blood pressure, neurological impairments, and behavioral disorders. Lead can seriously harm the nervous system (especially those of unborn babies), kidneys, and liver (4). Bacteria, mold, pollen, and dust mites all fall under biological pollutants. These nasty living things (not your pet—just his dander) cause poor air quality and a decrease in health. Exposure to mold compromises immunity and can lead to serious health effects like lung infections or disease (5). Biological pollutants also thrive in a damp indoor environment so it’s important to keep your indoor humidity at around 30%-60%. While asbestos is banned, homes and buildings older than the 70s’ still have it. It’s a natural mineral that was used for years due to its durability and chemical resistance. It has been used in everything from construction to hair dryers to car breaks and at its peak it was found in over 3,000 consumer products. You may already be familiar with the harmful effects that asbestos has on the human body. Asbestos has been linked to cancer and is the only known cause of mesothelioma (also linked to ovarian, kidney, esophageal, lung and others) (6). No smell. No color. Fire (gas fires or burners), home heaters, and water heaters can produce dangerous levels of carbon monoxide. Risks of CO include dizziness, headaches, vomiting, and nausea. Chronic long-term exposure has been linked to increased risk of heart disease. Unborn babies, infants, elderly people, and people who suffer from respiratory problems are at an increased risk for CO side effects (7). You can reduce exposure to carbon monoxide by keeping your gas appliances properly adjusted, installing an exhaust fan vented to the outdoors over gas stoves, and by repairing any leaks as soon as they happen. Materials such as plywood, fiberboard, glues, coating, and insulation release formaldehyde chemicals into the air and then we absorb it through breath and our skin. Gas stoves and wood-burning stoves also release formaldehyde. Individuals have reported negative effects like burning sensations in eyes, nose, and throat, skin irritation, coughing, and wheezing. The National Cancer Institute has concluded that exposure to formaldehyde may cause leukemia in humans. Investigators also noted that some studies suggest formaldehyde may have harmful effects on the lymphatic and hematopoietic systems (8). Pesticides are one of the most common air pollutants because no one wants critters crawling around their personal space—unfortunately, there are a lot of problems related to the use of pesticides. Many pesticides contain toxic chemicals and known carcinogens. In 1962, Rachel Carson exposed the harms of pesticides in Silent Spring and warned that if we were bringing them into our homes and bodies then we should know something about the nature of their power. Well, we know their power now- and it’s evil: acute dangers like skin irritation, headaches and fatigue all the way to chronic health effects like nerve damage and cancer down the road. A 2009 study by Agency for Toxic Substances and Disease Registry discovered that children who live in homes where pesticides are used are 2x more likely to get brain cancer than those who live in residences where no pesticides were used. Another study conducted in July of 2007 at the Public Health Institute, UC Berkeley School of Public Health and California Department of Health Services found a six-fold increase in risk for autism spectrum disorders (ASD) for children and women exposed to pesticides. In addition to ASD, pesticides can lead to a variety of cancers the most prominent being non-Hodgkin’s lymphoma, leukemia, brain, bone, liver, prostate, and testicular (9). Radon is a radioactive gas found in the soil under some homes- you can’t see or smell it but its found in nearly 1 in 3 homes in the U.S. The Surgeon General’s Office and the Environmental Protection Agency estimate that radon causes 20,000 lung cancer deaths per year. Primary exposure is ingestion and inhalation. Testing for radon in your home is necessary for reducing your risk of cancers (10). This one might be obvious, but when your home doesn’t have proper ventilation it creates a home for mold and other air pollutants that result in terrible air quality and health problems. Inadequate ventilation poses a problem for buildings that aren’t designed to minimize the amount of outdoor air that can “leak” in and has higher indoor pollutant levels (11). The number one choice you can make towards pure, pollutant-free air is investing in a high-quality air purifier. The best air purifiers, the ones I am going to recommend, use natural filtration systems that eliminate at least 99% of airborne pollutants. Since there are some air purifiers that target people with allergies better than others, I’ll be offering options for those with respiratory problems and others who just want to eliminate excessive toxins. First, I’m going to give you an inside look at the must-have features of a stellar purifier. Pre-filters work to capture larger particles like pet hair and dust as they help slow down VOCs before they enter the next filter. A purifier with a pre-filter makes it hard-core. Probably the most popular filter on the market is the HEPA filter. HEPA (High-Efficiency Particulate Air) filter is designed to trap 99.97% of airborne particles that are .3 microns (super small and most penetrating particle size). All top-rated air purifiers have HEPA air filtration- and do an amazing job when it comes to allergy relief. Any system with a heap filter is a good idea for a person with allergies. Make sure to watch out for HEPA-type filters, that means that they aren’t true HEPA filters. While a HEPA-type filter does wonders for pet dander and other large particles, it won’t help with small particles. Airmed air purifiers are the purifiers we have in our home. With large and small options you can find a perfect purifier for smaller rooms like your kitchen and office or bigger rooms like your den and basement. The smaller one (Airmed 1 MG Supreme) is our favorite. It’s packed with 7 lbs. Of activated carbon combined with HEPA filtration, this compact travel purifier removes 99.97% of airborne pollutants. Not only does it purify your air but it also clears odors making it perfect for people with allergies. No assembly required and ridiculously easy to use, you just simply turn on and adjust how much you want the filter to work. The best part is that you can control the white noise as well. Either make it completely silent or fall asleep with it on low white-noise and you bet you’ll sleep like a wiped-out puppy. Orsani has a pre-filter and v-HEPA filter. With an activated carbon filter, it not only removes pollen, dust, pet dander, mold, and bacteria but also removes light odors and gases. It also comes with a built-in air quality sensor feature. Users do admit that the display is not as helpful as they would like. For a HEPA purifier it is relatively quiet and works wonders for people with allergies. It also comes with a complete set of filters that will last you a year! The PECO filter is new technology that has been developed over the last two decades. It can destroy pollutants 1,000 times smaller than the HEPA and utilizes free radicals to oxidize breakdown pollutants. Easy on the eyes, this dual-filtration system comes with a pre-filter and a PECO-filter. The PECO filter works to break down bacteria, viruses, and other toxins when activated by light. Its 360 design is built for larger rooms (600 sq. ft) and can pull in pollutants from all sides and projects clean air evenly throughout the entire room. Easily portable, this system is extremely quiet and energy efficient as it doesn’t rely on powered fans. If you’re interested in protecting your family from excessive toxins, this purifier is another good option. Filters are provided on a subscription basis at $129 per year. Managing humidity is key in tamping down poor air quality resulting from mold, bacteria, and dust mites. You can manage humidity by increasing ventilation or getting a dehumidifier. If your humidity is a result of water damage, address it with a professional company. Your ideal humidity level should be between 30%-60%. Thorough house cleaning prevents dust mites, dander and pollen. To help eliminate pollutants, vacuum and dust often. Include inspecting and cleaning your heating and air conditioning units in your cleaning routine. Let some fresh air in! Fully opening windows will allow some indoor pollutants to escape and fresh air to circulate through your home. Get rid of chemical-filled cleaning supplies and switch to natural alternatives. Switch out your commercial pesticides for non-chemical pest removers (using essential oils to help say see ya later to them). And ditch trash cosmetics that are filled with lead, formaldehyde and other toxins. Check our article on The Complete Guide to Natural Beauty for great non-toxic alternative options. There are some great home air quality test kits that allow for you to do an easy at home test, send it back to the company and receive results of the causes of air pollution in your home. Look for an air test kit that tests for mold, VOC, formaldehyde, pollen, dust, dander, and asbestos. You can also look for lead tests and carbon monoxide tests. For more information on these check out our air pollution article. Now I would love to hear from you on your poor air quality solutions! If you have an air purifier that you love that I didn’t mention or some other tips and tricks, comment below! “Indoor Particulate Matter.” EPA, Environmental Protection Agency, 19 Sept. 2018, www.epa.gov/indoor-air-quality-iaq/indoor-particulate-matter. McMichael, A J. “Carcinogenicity of Benzene, Toluene and Xylene: Epidemiological and Experimental Evidence.” Current Neurology and Neuroscience Reports., U.S. National Library of Medicine, www.ncbi.nlm.nih.gov/pubmed/3053447. “Asbestos | Why It’s Dangerous and How It Causes Cancer.” Mesothelioma + Asbestos Awareness Center, 24 Oct. 2018, www.maacenter.org/asbestos/. “Carbon Monoxide Poisoning.” Centers for Disease Control and Prevention, Centers for Disease Control and Prevention, 26 Oct. 2016, ephtracking.cdc.gov/showCoRisk.action. “Radon Fact Sheet.” Radoncom, www.radon.com/radon_facts/.